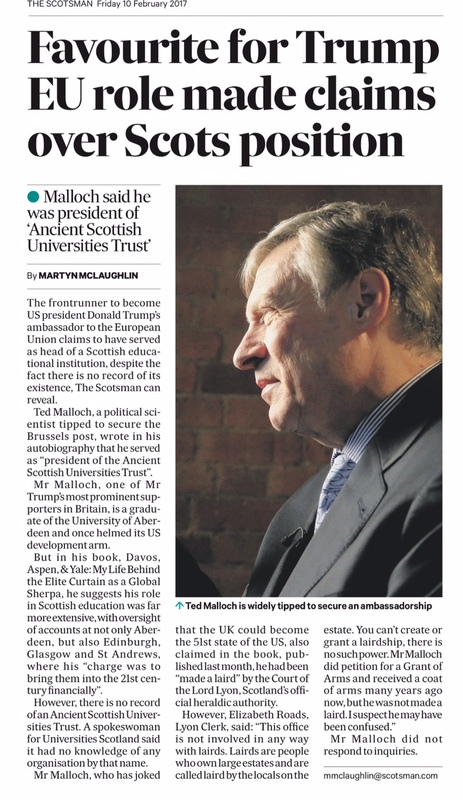 Trump’s EU ambassador pick was head of non-existent Scots body – from The Scotsman – An exclusive showing how Ted Malloch, the then favourite to become the US ambassador to the EU under Donald Trump, claimed to helm a non-existent Scottish educational institution. The frontrunner to become President Donald Trump’s ambassador to the European Union claims to have served as the head of a Scottish educational institution, despite the fact there is no record of its existence. Mr Malloch, one of Mr Trump’s most prominent supporters in Britain, is a graduate of the University of Aberdeen and went on to helm its US development arm. But in his book, he suggests his role in Scottish education was far more extensive, involving oversight of the accounts at not only Aberdeen, but Edinburgh, Glasgow and St Andrew’s universities. However, there is no record of an Ancient Scottish Universities Trust. A spokeswoman for Universities Scotland, the representative body of Scotland’s 19 higher education institutions, told The Scotsman it had no knowledge of an organisation by that name. Mr Malloch has upset leaders this side of the Atlantic by comparing the European Union to the Soviet Union and has joked that the UK could become the 51st state of the US. A professor of strategic leadership and governance at Henley Business School in Reading, he is a regular contributor to BBC programmes such as Radio 4’s Today and The World at One, and Newsnight. But the publication of his latest book, documenting his whirlwind international career in economics and foreign relations, has raised a series of questions over the veracity of his claims. However, the court said Mr Malloch’s claim could not be true as neither it nor any other authority have the power to confer a lairdship on an individual. The Financial Times has also cast doubt over excerpts from Mr Malloch’s book, published last month. It includes his claims that former prime minister Margaret Thatcher described him as a “genius,” which is not corroborated by a video recording of the event in question. The newspaper has also pointed out while Mr Malloch has said a documentary he presented had been nominated for an Emmy award, it was not shortlisted. Mr Malloch, who said he has been interviewed at Trump Tower and vetted for the ambassadorial nomination, has yet to respond to The Scotsman. The apparently misleading and erroneous claims have raised concerns over his suitability as an ambassador, according to the leader of the one of the largest political groups in the European Parliament. In his book, Mr Malloch writes extensively about his Scottish heritage, stating that he is active in the St Andrew’s Society, and proudly wears the tartan of Clan Gregor. Elsewhere, he lists his favourite single malts and golf courses in Scotland, including a special mention from Trump International Golf Links (“Maybe this is why America needs Trump in the Oval Office. He gets things done that other people cannot even imagine”).